A common misconception advertisers associate in pay per click advertising is that if you increase the CPC of your adverts and spend more on your campaign, you will gain more conversions. This might be true. However, in most cases, it is a lie. Spending more on a campaign will not always result in more conversions. 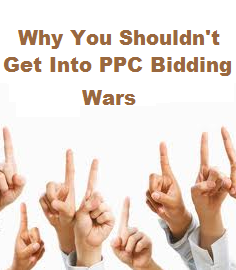 This is the first reason why you should not get into bidding wars with competitors in PPC. Here are some more reasons below. Before I go any further, it is important to understand what a bidding war is. A bidding war in PPC is when you feel it necessary for the success of your campaign to increase your advert’s CPC in reaction to competitors in order to gain the best ad positions on publisher websites. The problem with increasing your CPC to gain best ad position is that your competitors will be doing the same. This is the start of a viscous cycle where CPCs keep increasing just like a bidding war on eBay. If ever you find yourself in a situation where your CPC doesn’t reflect your budgeted CPC, you should be safe rather than sorry to say you are in a bidding war. If this is the case, stop. The further you go into a bidding war, the harder it is to get out of one. Below are the main reasons why you shouldn’t get into a bidding war. As I have already mentioned, the cost of getting into a bidding war can be extremely high. All advertisers should have at least a rough idea on how much they should be spending per click to make their campaign profitable. Therefore, if they feel they are going over this ‘budget’ it is now time to act. If you don’t know what to do in this situation of knowing you are in a bidding war, look to implement a contingency plan into your PPC campaign: especially coming towards the holiday season where the chances of a bidding war will increase. One of the benefits to pay per click advertising is that you can create a campaign in under five minutes and literally leave it to bring your landing page contextual traffic. It is good to tweak your campaign every now and then. However, PPC was not designed to be constantly monitored. When you get yourself into a bidding war, you will find that you will be constantly resorting back to your campaign to increase the CPC which will take up alot of time. Excuse me if ‘non-contextual’ is not a word but I hope you get the idea. With a PPC campaign comes keywords that you bid for. This is what advertisers are bidding for: keywords. Bidding wars happen because advertisers want the prime locations on the best websites for a certain keyword. Therefore, the CPC for that specific keyword will increase due to the bidding war. There are now two options: 1) carrying using that keyword at the higher CPC or 2) change your keywords to a keyword unaffected by bidding wars. This cheaper alternative may be less relevant to the first keyword and your campaign. But, the problem is that your budget might state the only keyword you can afford is the less relevant one.